This completely organic aloe/cream lotion is carefully formulated here at Stillpoint and is made with our organically pressed aloe vera gel, our unscented lotion and a touch or Rosemary C02 antioxidant extract. The combination of our aloe and lotion provides the benefit of both. It is not greasy, skin penetrating and healing. Rosemary Co2 antioxidant extract also has tremendous healing properties all on its own and acts as a natural preservative to boot! 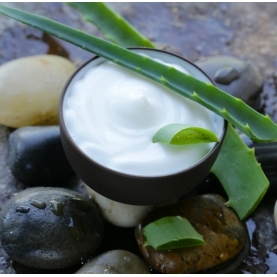 Aloe cream has been found to be very beneficial for psoriasis, eczema. It is suitable for all types of skin and blends awesomely with other carries and all essential oils and extracts. very rich in polysaccharides, they give aloe its wound healing and anti-inflammatory properties. contains powerful antioxidants, which belong to a large family of substances known as polyphenols. (.The polyphenols, along with several other compounds found in Aloe vera, have been shown to inhibit the growth of certain bacteria that can cause infections. can slow aging of the skin (In one study of 30 women over the age of 45, topical application of the gel was shown to increase collagen production and improve skin elasticity over a 90-day period. Way back in 1959, the FDA first approved Aloe vera ointment as an over-the-counter medication for skin burns. cools inflamed sites this is because as the water evaporates the oil content increases, evaporation slows and skin moisture is maintained. used as a moisturizer to treat or prevent dry, rough, scaly, itchy skin and minor skin irritations (like diaper rash and skin burns from radiation therapy. helps treat your skin when it's dry and prevent it from drying out again. Moisturizers, including creams and lotions, do this by holding water in the stratum corneum, the outermost layer of the skin. exhibits broad-spectrum antimicrobial activity against 29 types of gram positive and gram negative pathogens. effective to assist healing in the treatment of acne vulgaris, seborrheic eczema, and, sometimes, atopic dermatitis. multi-functional anti-aging agent, in that it protects components within our cells against not only oxidation but inflammation too. inhibits the grown of various Candida strains. protects stressed skin against early aging.